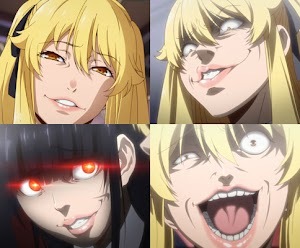 In Japanese, there are two types of tsu characters. The normal tsu つ, and the small tsu っ, which is smaller. You can notice this in hiragana in words like mittsu みっつ, "three," and in katakana in words like nattsu ナッツ, "nuts." But how does this small tsu works? What is っ for? And what is it called? Well, to begin with, this small tsu is literally called "small tsu" in Japanese, chiisai "tsu" 小さい「っ」 or chiisana "tsu" 小さな「っ」. Unlike other kana the small tsu does not represent a syllable sound. Instead, it represents a "clogged sound," tsumaru oto つまる音, or a "geminate consonant," sokuon 促音, which is also called a "double consonant." When the small tsu comes before a kana in a word it turns the consonant of that kana into a double consonant. Some double consonants are pronounced with a glottal stop at the start, which is a sharp pause in pronunciation that happens when you close your vocal tract (specifically, the glottis). When the small tsu comes at the end of a word or sentence, it always indicates the glottal stop and makes the pronunciation of the word end with a sharp stop instead of the slowly fading to silence. In romaji, the small tsu at the end of words and sentences is usually not represented. This is probably because using the small tsu in this way was not a common practice in Japanese when romaji was popularized. Since the small tsu at the end produces a glottal stop, it could be represented by an apostrophe ' in romaji, which represents glottal stops, but it's unlikely you'll ever need to know this. In this article, as well as in this entire blog, when a consonant is repeated in romaji it indicates a small tsu in the reading of the Japanese word. 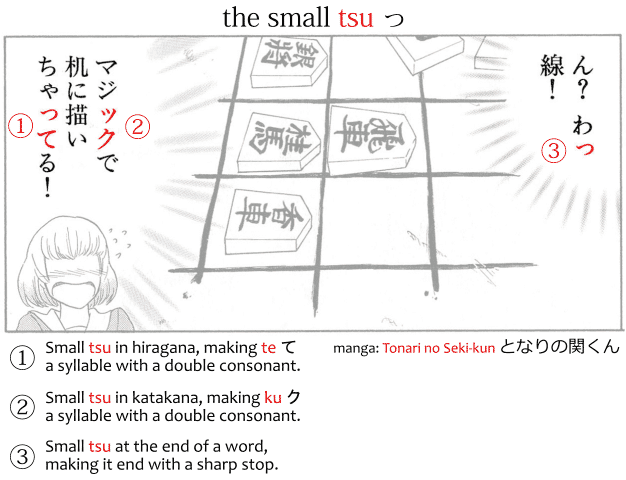 The pronunciation of the small tsu depends on how it's used. If it's used at the end of a sentence or word, the small tsu indicates a glottal stop, closing of the vocal tract, which means an abrupt, dry stop at the end of the word. This makes the ending feel shorter and rougher than normal, instead of the long, soft fade out it usually has. When the small tsu appears before a kana certain rules should be followed for the pronunciation of double consonants, that is, not all small tsu sound the same. Generally speaking, the small tsu becomes a softened intro for the consonant, which ends up coming out stronger than usual. Double consonants also take longer to pronounce than normal consonants. For example, if it's kka っか, tta った, ppa っぱ, or other syllables alike, you'll want to pronounce it with a slight pause in place of the small tsu, followed by a stronger pronunciation of the kana after it. Think of a drummer hitting the drums. ta ta ta vs. ta ta TTA! Now, for tsu つ, tchi ち, ttcha っちゃ, ttcho っちょ and ttchu っちゅ, it's a little different because these sounds are between other t syllables and s syllables. So you'll most likely end up letting out a bit of "tchi" or "tsu" before the double consonant. Imagine saying nante ko-tchi-tcha, now nante ko-tchi-a, and then finally nante kottcha なんてこっちゃ. For syllables with s consonant, like ssa っさ, it follows a principle similar to the above. The small tsu becomes pronounced like the start of the s. Imagine a lizard or snake speaking. The word sassato さっさと becomes sa-sssSSSSSSsss-sa-to. Well, not that long, but you get the idea. Most words in Japanese that have double consonants follow the rules above or similar. This is because not all consonants can become double consonants in native Japanese. There are no words, for example, with a rra っら double consonant, or jji っじ double consonant. These only happen in words imported from other languages, like "badge," bajji バッジ. Quoting particle. Used to reference something someone said. In the words above, with the exception of the last pair that's usually written with kana only, it'd be difficult to mistake them while reading because they're usually written with kanji, not kana. However, when writing, it's important to note that one thing is not the same as the other and the small tsu makes them different words completely. Own discretion. Own way. By oneself. In onomatopoeia the small tsu always represents a glottal stop, but in prefix words the pronunciation depends on the word it's prefixed to. So buttobasu ぶっ飛ばす uses the tto っと pronunciation, but buttsubusu ぶっ潰す uses the ttsu っつ pronunciation. A special case happens when the small tsu is at the end of a sentence. Although it represents a glottal stop just like it would in a word, when the small tsu ends a sentence it implies a sense of exclamation and brashness. It doesn't change neither meaning nor grammar of the sentence, but adds nuance. It works like an exclamation point or half of an exclamation point. It's common to even see it used together with exclamation points. This usage happens often in manga, written dialogue of stories, and other places where onomatopoeic writing is to be expected. Like in rather comedic, exaggerated reviews and comments written on a film cover, or a magazine cover, etc. It's expressive, so it's unlikely to show up in formal writing, but common to see in more casual internet forums and messaging. An example would be a gang-y character yelling kora'! こらっ！ to call somebody's attention. (the meaning is similar to "hey, you!" or "watch out!" in English). 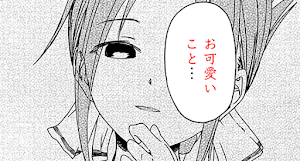 Although kora こら alone would suffice, the small tsu at the end shows the character is voicing the yell harshly. With anger. Or annoyance. This also happens with scared-ly voiced shrieks: gya'! ぎゃっ！ and so on. An important thing to note is that the small tsu at the end of a sentence is purely stylistic: it's used to stylize speech sounds. It doesn't do much that an exclamation point wouldn't do. In fact, you may find that some manga do not use the small tsu at the end of sentences at all, while some do it with frequency. In the same way, some manga use exclamation points, while some never use exclamation points. Some use ellipsis (three dots...) while some never use it. Etc. Similar to the above is the usage of the small tsu at the start of sentences. Some words do start with the small tsu, like tte って, but most do not, and we're talking about those now. When it gets added, it likewise expresses an effect of exclamation and brashness to the voice. Example: kka! っか！ This is an interjection, I suppose. Maybe the character just saw or noticed something sudden and went "wAT?!" Another one: ttemee!!!!! 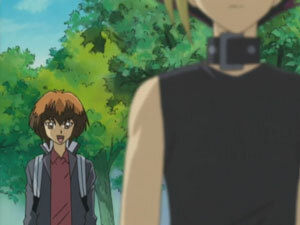 ってめぇ！！！！！ This is the word temee てめぇ, a second person pronoun, meaning "you." And the speaker was so damn mad at "you" his tongue clicked hard when in rage he yelled the te て, turning it into a tte って. The prolonged sound mark ー works in a way similar to small tsu, but opposite. In the word above, the ta タ syllable has both a double consonant and a prolonged vowel. Using any decent IME software in a computer, the small tsu can be typed in two ways. First, if it's the middle of a word just repeat the consonant like you'd do in romaji. If you type kka it becomes っか. If you type kke it becomes っけ. If you type tta it bcomes った. Etc. 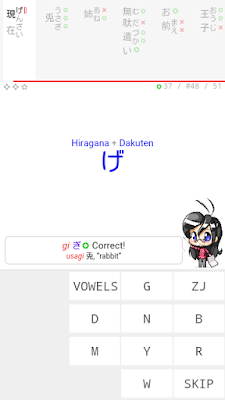 To type the small tsu by itself without having to type another kana, you can do it by using the small kana prefix before the input code for the normal tsu. Normally, the small kana prefix of an IME is x and or l (L), and the input code for the normal つ is tsu or tu. So typing ltsu, xtsu, ltu, xtu is how you type the small っ. 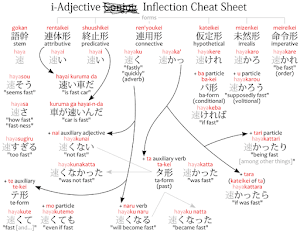 Should the inlongated constant be the same in the word "つかれています" to be tired?? So in this case would the sound be more "kkaretei imasu"
つかれています has a normal つ, not a small っ. So it's tsukareteimasu, normal consonant, not kkareteimasu, double consonant. Sometimes you see the interjection tsukka つっか used in anime. You'll notice the ka in tsukka つっか, which is double, and in tsukareru つかれる, which is normal, sound different. I have listened to several anime songs in which they pronounce/sing the small tsu by doubling the vowel, just like a prolonged sound mark. 逢いたかった, that means something like "I wanted to see", in the Ranma's song この世でいちばんお正月が好き, and, in that song the singer sings "aitakaAta". The other one is Watashi-tachi ni naritakute, a Sailor Moon one. They sing 光ってる as hikaAteru. Does it happens only when singing or am I missing something? You're missing the fact that those are songs. When singers sing, be it in English or Japanese, they stretch some words sometimes, and the lyrics probably won't reflect that. I mean, nobody writes a lyric "I looooooooooooooove you," they just write "I love you," no matter how long the "o" goes on. Same thing.